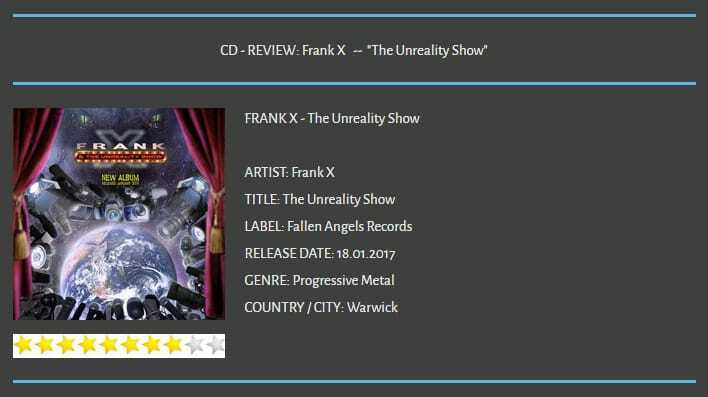 One of the most positive surprises in the new year will flutter us into the house with FRANK X's second album "The Unreality Show". Refrains and guestvocals, such as the stomping midtempo-bangers "Randomonium Drugztore", where GORGUTS frontman Luc Lemay contributes his growls, will hang directly at the first pass in the auditory canal. The beauty is, however, that they do not leave this quickly. "The Unreality Show" presents FRANK X more sophisticated and mature than ever. Whether you want to play "Into The Maze" or "Free Tokens At Bugs Casino", you will discover new musical nuances that keep the album exciting forever. "Gluttonomy" and "The Unreality Show", the mighty "Twisted Furrows" and the playful "The Great Blue Butterfly", although none of the songs on the record really need to be hidden. The songs are so straight out of the boxes that they can get into the metal's blood without any detours. The same is true of the simultaneous, yet powerful, production that makes every instrument come into its own. The basestrum melts as splendid as the bass bubbling and the riffing just as little as the singing, the acoustic passages do not ever mute. It is noteworthy that FRANK X keeps the song as such in the eye and ear, and with the rich selection of influences, ideas and arrangements does not drift into too crude and annoying praise to own abilities. These would be strong songs like the catchy and highly varied "Anger Poppers" and "Fear Plague" or the powerful driving "Carnival Of Monsters". Bottom line remains a class album, which bursts before earworms and hits only so.